The new lighting system would save as much as 75 percent of the energy costs, and provide facility operators greater control over the lighting. 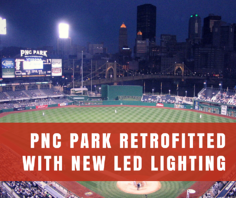 This sits in well with the Pittsburgh Pirates President whose aim was to improve user experience and bring the performance capabilities of the stadium at par with other competitors. The system being installed features Ephesus Stadium Pro fixtures along with wired DMX control system. The control system holds 100% dimming capabilities, tuning features and advanced controls within each of the fixture. The lighting still illuminates uniformly over the surface, providing top-notch quality to viewers in the stadium as well as those enjoying HDTV. One of the best things about the system is the little maintenance it requires compared to traditional lighting systems. This combined with all of its other features has made the solution a testament to the power of LED lighting, and its ability to enlighten heavy-duty environments. Interested in learning more about the power of LED lighting?